Dr. Greg and Lisa Popcak are the founders of the Pastoral Solutions Institute, an organization dedicated to helping Catholics find faith-filled answers to life's difficult questions. They are co-hosts of More2Life Radio, airing each weekday on over 300 stations affiliated with the EWTN Global Catholic Radio Network and on SiriusXM 130. They are also co-authors of more than twenty books and programs that integrate Catholic theology with insights from counseling psychology. 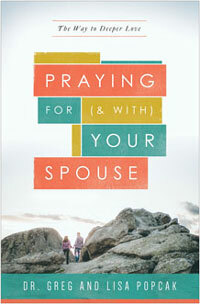 Praying for (and with) Your Spouse will show you how to let God take every part of your relationship to the next level—from living each day with your joys and struggles to working out your decisions and disagreements to setting aside time for love and romance.